* Blues Brothers Soul Band, Basilico’s Hand Tossed Pizza. 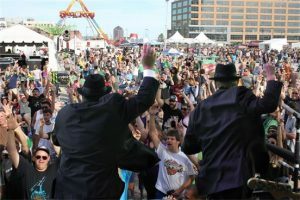 Jeff Eats and Mrs. Jeff Eats have seen the Blues Brothers Soul Band loads of times- trust me, these guys are absolutely awesome! 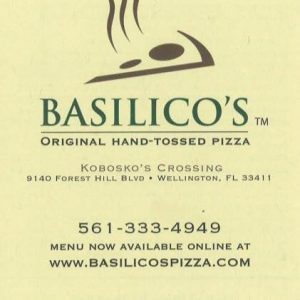 ***** Basilico’s Original Hand-Tossed Pizza, 9140 Forest Hill Boulevard, Wellington, Florida 33411, (561) 333-4949. Last night, Jeff Eats took-out from red sauce Italian joint… Basilico’s Original Hand-Tossed Pizza in Wellington. and I gotta tell you, this restaurant makes some really delicious stuff. Real simple concept, order at the counter/takeout…or the food is delivered to something like 6 inside booths/handful of outside tables. By the way, the restaurant is located in a very quaint cool looking “New England” style strip-center…which also has a Chinese joint, a Dunkin’ Donuts, an ice cream store, a custom cake- making store, a liquor store–you won’t think- you’re in Florida! Real interesting, in addition to ice cream and yogurt-the ice cream store sells fresh orange juice quarts/gallons-candy by the pound, and has a whole area for fresh flowers…the Chinese joint which is basically a takeout has 4 large 6- seat booths-for those who want to eat-in. Like I said 1 second ago, the strip center has a real different feel to it! Jeff Eats “got to” Basilico’s around 6:30pm last night and there was something like 8 guys behind the counter making pizzas etc. and 2 young ladies at the register. In the 25 minutes or so that I waited for my order, every booth inside was taken and I watched numerous pickups and phone orders being taken…I didn’t notice anyone eating outside. Basilico’s menu is loaded with appetizers, salads, pizzas, pastas, strombolis, calzones, hot/cold subs, entrees. You can check its menu/prices at basilicospizza.com. Ordered items included large 16″ pizza ($9.99), Chicken parmesan sub ($7.99), sausage & peppers stromboli ($6.79), eggplant parmesan entrée (pasta side/garlic breadsticks- $10.59) and like I said 3 seconds ago, the stuff was really delicious. Jeff Eats has been to his fair share of red sauce Italian joints down here in south Florida and- this Basilico’s joint is a huge winner. The food was really-solid, the prices CHEAP (I believe I’m suppose to say inexpensive or very reasonable)-trust me, Basilico’s gives you a ton of food for cheap-money-and the food isn’t crap quality! Let me wrap this up for you, if Basilico’s was by my house (which unfortunately it isn’t) Jeff Eats would definitely be a very steady customer. Basilico’s Original Hand-Tossed Pizza is open 7 days a week. I’ve seen the band and they are terrific. The band is great, so is the Restaurant. Great combo. Jeff in that same plaza is one of the best Thai places in South Florida.. If you like Thai is a must try.